If you join Advisory Excellence you will also receive a printed Certificate of Excellence for your offices, which will be personalised and delivered to you by 1st Class Mail. Founded in 2013, the Certificate of Excellence honours firms that deliver consistently great service. This designation is given to experts who have been recognised by Advisory Excellence over the past 12 months. Establishments earning the Certificate of Excellence are located all over the world and do outstanding work. This would look great on the wall in my office… hint, hint!! Hello! Thank you for your comment. If you would like to apply for membership, simply fill out the form on our ‘Apply’ page. Good luck with your application. 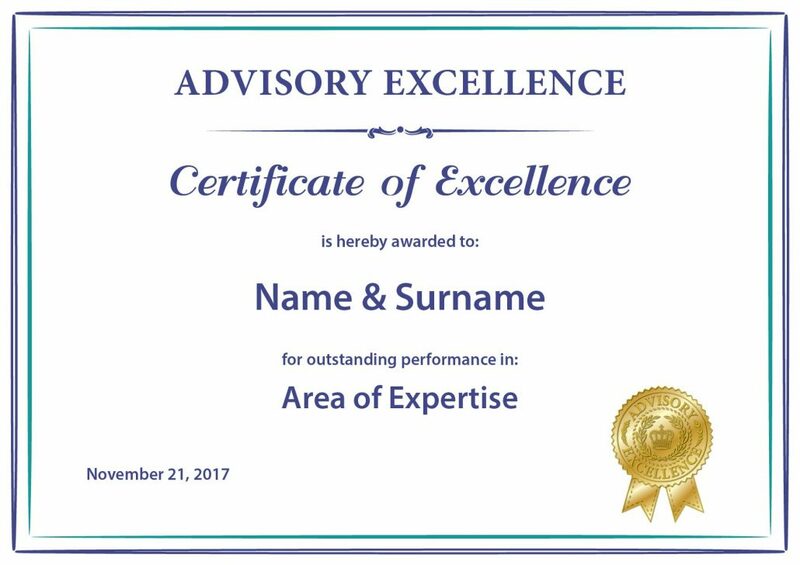 Advisory Excellence has been a valuable resource these past few years. I now only do business with advisers who have this certification behind their practice. Keep up the excellent work!